With some 87,000 pint glass attacks every year, the U.K. bar scene is rough enough to make a cowboy shake in his boots–this ain’t the wild west, and they don’t use sugar glass. The NHS estimates it spends £2.7 million on bar-fight injuries yearly. Until recently, there have really only two choices for a safer glass: plastic, which everyone hates, and toughened glass, which breaks into cubes instead of shards, but is marred by high production costs, inconsistencies in toughness from glass to glass, and explosive breakage. Now, as part of the Design Council’s Design Out Crime program, U.K. ad agency Design Bridge has released two new options, Glass Plus and Twin Wall. 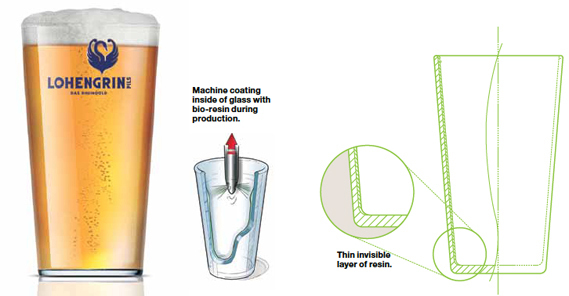 Glass Plus (above) is a regular pint glass with a thin film of resin sprayed inside that keeps the glass together if it breaks. It’s a simple and cheap solution that Design Bridge says would be easy for glass-makers to tack on to the end of their production process. Plus, like any good ad agency, they envision branding opportunities on the resin film. Twin Wall is made of two layers of glass sandwiched around a layer of resin, like a car windshield. The glass is stronger, and the angled walls make beer pour better. But the glass is also heavier, which makes it a more powerful projectile, whether it breaks on impact or not. The best thing about the new glasses (besides safety, of course) is that they look like the old glasses. 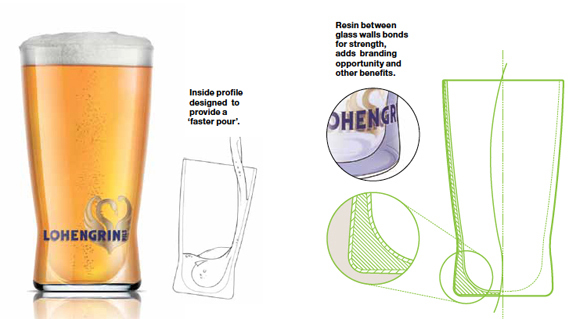 The imperial pint is as iconic as any British product, and Design Bridge was smart not to mess with it. Beer drinkers are touchy enough as it is.